Embassy of China in Nepal, under Arniko Society and China Scholarship Council (CSC) organized awarding ceremony of the Chinese Government Scholarship at Radisson Hotel, Lazimpat on 26th August. 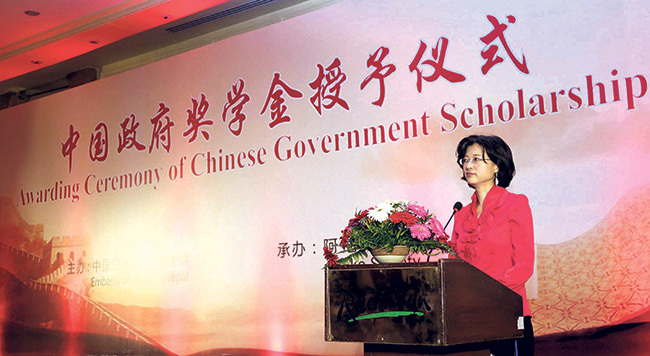 China Government Scholarship is set up by the Ministry of Education (MOE) to enhance cooperation and exchanges in the various kinds of fields such as education, science and technology, culture, economics and trade and so on. 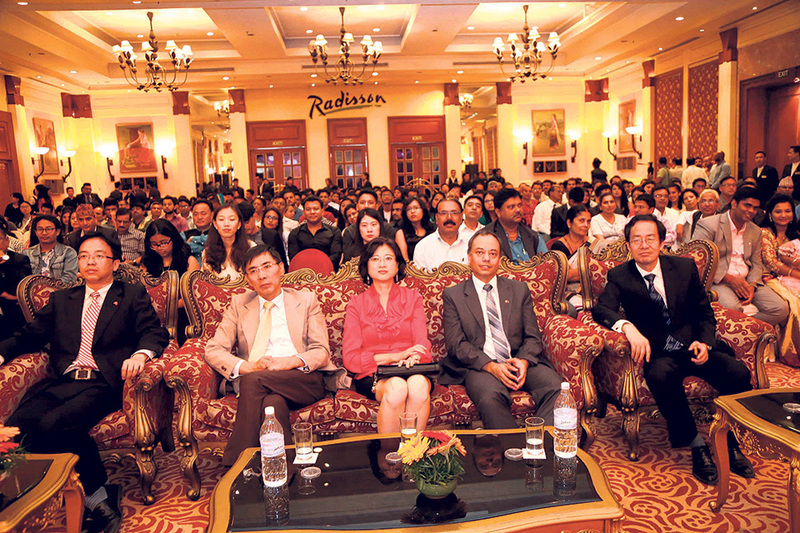 Large number of beneficiaries of the grants were seated along with their parents in the Nepal-Dhuku Hall Ballroom at the Hotel. Staff from the Council, MoE as well as the Embassy of China was present in the event, along with a few new and old Nepali students from China. The students were informed about the types of scholarships and their consequences, the culture and language shock, the infrastructural gap, classrooms, teachers and all necessary details. Rohit Shah, Project Manager at Huawei, who completed his Bachelor's and Master's in Communications and Technology from the Beijing University of Post and Telecommunications told the students that they will be representing Nepal outside of Nepal. "After a long hardship, I received the 'Foreign Outstanding Student Award' and I know all of you have the caliber to do so", Shah wished the students good luck. After a few advices and acknowledgements, the students were called one by one to the stage to receive their scholarship certificates. Manish Prasad, who completed his Bachelor's in Civil Engineering from Pulchowk Campus said that he was going to the Shanghai Jiatong University to complete his Master's in Civil Engineering. "We give the test by MoE and the results allot which university we're going to and what scholarship we're receiving", he said, "I'll probably be leaving in early September." A plus-two student from Madan Bhandari Memorial College, Pukar Chalise, went on the stage to represent the students leaving for their undergraduate studies, told everybody about Engineering in China and Tsinghua University. "It is an economical thing to do, a China Government Scholarship", said Dinil Joshi, a high-school graduate from St. Xavier's College, Maitighar. "I got into Beijing University of Post and Telecommunication which is one of the best universities for engineering there", he added," My parents are very proud of me, but I still fear the language clash."